Originator: Hall, S.M. and Mihalasky, M.J.
Abstract: Grade and tonnage data for calcrete-type surficial uranium deposits found in 11 different countries were compiled. Fifty-eight deposits with reported grade and tonnage, and thirty-five occurrences for which there is no reported resource are tabulated in separate Excel workbook spreadsheets. Supplemenatal Information: Calcrete-type uranium deposits are a subset of the International Atomic Energy Agency surficial deposit type, and are found in arid environments associated with non-pedogenic calcrete (Toens, 1984). The resource data in this compilation derives from technical reports following international reporting standards, company reports, and published literature referenced for each deposit with details of the reference on a separate sheet (see the database metadata for additional information on data quality). For each deposit, a primary and alternate name, if appropriate, is listed. Some deposits were aggregated into a larger projects as noted in Mauritania, Argentina, Tanzania and Botswana. USGS disaggregated larger projects into individual deposits where possible, and in these cases the larger project name is identified in the alternate name column. The resource category is shown for each deposit as listed in the cited reference. Some resource estimates are historic with limited support data, while others are more robust estimates compatible with either JORC (Australasian Code for Reporting of Exploration Results, Mineral Resources and Ore Reserves, 2012) or NI 43-101 standards (Canadian Institute of Mining, 2014). Mineral resources are reported as inferred, indicated and/or measured, listed in order of increasing level of confidence of the estimate. In-place (unmined) and mined material, are combined to determine the total in-place resource as required in undiscovered resource estimates (Singer and Menzie, 2010). When combining resources from different categories, a weighted-average by ore tonnage for the grade was calculated. Mining losses were not calculated, therefore the total in-place resource is a low estimate for the two deposits that have been mined. For the Langer-Heinrich deposit, mined uranium was only available from 2007 through 2015, so the total resource shown in this database does not include any material mined in 2016. A NI-43-101 compliant resource for the Trekkopje and Klein Trekkopje deposits was published in 2006 (Moran, 2006). However, in 2011, the property owner, Areva, announced this resource was an over estimate and inferred resources of 67.6 million lbs. U3O8 (UxConsulting, 2016) would be considered, therefore this value is used here. Total contained uranium oxide (U3O8), metric tonnes of ore and average grade (weight percent U3O8), are listed for each deposit. Metric tonnes of ore were calculated for some deposits when this information was unavailable using the “Wise Uranium” online unit converter (http://www.wise-uranium.org/cunit.html). If reported, the cut-off grade is also listed. Developers of some deposits reported multiple ore resource estimates at different cut-off grades. In these cases, the estimate with the cut-off grade closest to 200 ppm was selected to capture the greatest reasonable potential resource. Where possible, the company who currently is the primary contact for deposit information is listed, or the company that discovered the deposit for a historic property. The status of each deposit is indicated as dormant, exploration, feasibility study, permitting, or in operation. The year of the last status updated is also listed. 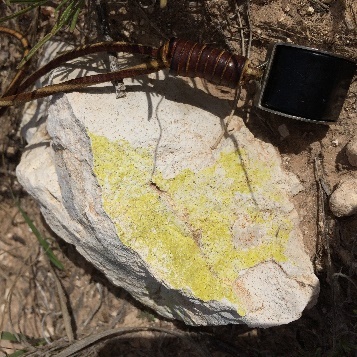 Purpose: These data were compiled by the U.S. Geological Survey (USGS) as part of an assessment of undiscovered uranium resources in the Southern High Plains of Texas, New Mexico and Oklahoma (Hall and others, in press). Access: None. Please see 'Distribution Info' for details. Use: None. Users are advised to read the data set's metadata thoroughly to understand appropriate use and data limitations. Logical Consistency Report: Tests for integrity have not been performed. Completeness Report: This dataset represents grade, tonnage, and location data for world calcrete-type surficial uranium deposits. The extent and completeness of the database reflects data availability at the time of the project (2016-2017). The project staff relied primarily on: (1) Smaller-scale compilations, which do not always include information to resolve detailed geologic and metallogenic features, (2) The experience, knowledge, and access to non-public data of international cooperators, (3) Academic publications in the scientific literature, and (4) Promotional materials from the websites of mineral exploration companies. Our cooperators provided invaluable expertise and insights about existing research and datasets. Regional and large-scale metallogenic studies and maps from scientific papers and exploration company materials also proved to be essential to the calcrete-hosted deposit compilation effort. In addition, site visits and Google Earth imagery often provided a means by which to verify the locations of deposits. Horizontal Positional Accuracy Report: The location data for world calcrete-type surficial uranium deposits were compiled from variety of sources, presumably captured originally as point-locations using a variety of methods, from GPS point-acquisitions to hand-plotted locations from paper maps. As such, the positional accuracies of the deposit site point-locations may be different, and the feature that the point represents may also vary (e.g., one point may represent the center of an open pit; another may represent the center of a mineralizing system; etc.). The source data for a given deposit location should be consulted for detailed information on its positional accuracy (if such information is available). For the purposes of this dataset, a map scale of 1 million was assumed, which represents an approximate ground-resolution of about 2 km. But it should be noted that the point-locations of many of the deposits may be significantly better than 2 km (1 km or less, representing approximately 1:500,000 or larger scale). As such, all locations should be considered with care, and should be further evaluated using data of appropriate scale and resolution. Accuracy Explanation: Empirical: See description in "Horizontal Positional Accuracy Report" of this metadata document. Distribution Liability: Although these data have been processed successfully on a computer system at the U.S. Geological Survey, no warranty expressed or implied is made regarding the display or utility of the data on any other system, or for general or scientific purposes, nor shall the act of distribution constitute any such warranty. The U.S. Geological survey shall not be held liable for improper or incorrect use of the data described and/or contained herein. Any use of trade, product, or firm names is for descriptive purposes only and does not imply endorsement by the U.S. Government. Although this information product, for the most part, is in the public domain, it also contains copyrighted materials as noted in the text. Permission to reproduce copyrighted items for other than personal use must be secured from the copyright owner. These data have been approved for release and publication by the Director of the USGS. Although this database has been subjected to rigorous review and is substantially complete, the USGS reserves the right to revise the data pursuant to further analysis and review. Furthermore, it is released on condition that neither the USGS nor the United States Government may be held liable for any damages resulting from its authorized or unauthorized use. Contact Instruction: For inquiries regarding this document, please include the metadata contact person's name, dataset name, and publication series and number.